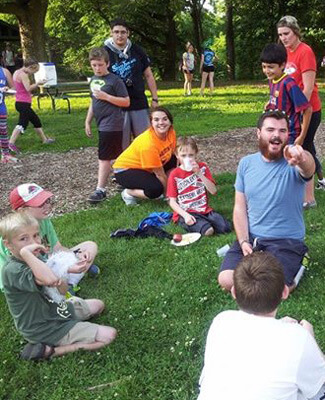 CLCE major Carson Cross served this summer as assistant director of Camp Shaw-waw-nas-see in Manteno. Students and alumni of NIU’s Community Leadership and Civic Engagement (CLCE) program spent the summer making a difference, doing the type of behind-the-scenes and in-the-trenches work that helps nonprofit organizations thrive. NIU’s Center for Non-Governmental Organization Leadership and Development (NGOLD) oversees the CLCE degree. It is one of the few programs nationally that teaches practical nonprofit management skills while providing a framework for grassroots organizing and social movements that can change a community, or the world, for the better. The CLCE program has been a resounding success since it was launched at NIU in 2012. Originally designed as just a major, NGOLD added a minor and certificate to allow greater reach among students in a wide range of disciplines. After only two years, the program already enrolls more than 170 students. This summer, the work of NIU CLCE alums and current students included efforts to advance immigrant rights, anti-poverty campaigns and the objectives of local nonprofits, ranging from a symphony and museum to a chamber of commerce and summer camps for children. 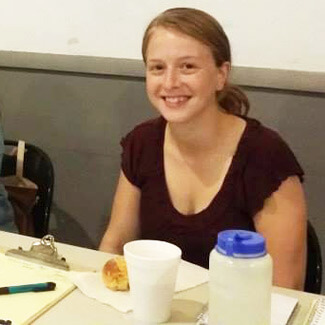 Katie Birkey of West Chicago, a May graduate of the CLCE program, is now involved with a statewide organization focused on immigrant and refugee rights. Birkey was tasked with registering 1,000 new voters by September, with a special emphasis on Latino communities. Katie Birkey has been busy registering voters. “I have been told that my fellowship with the Illinois Coalition for Immigrant and Refugee Rights is probably going to be one of the toughest things I’ll ever do,” Birkey said. “So far, I believe it. Dave Anians (May 2013) of Burbank continued his tenure with the anti-poverty program AmeriCorps VISTA, doing outreach work with Instituto Del Progreso Latino. 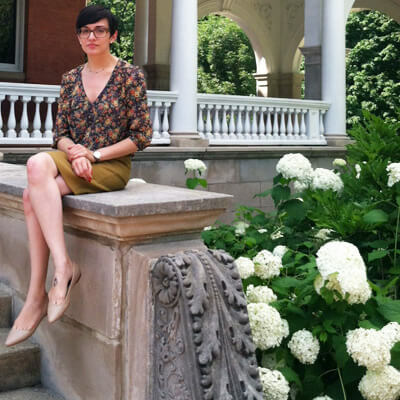 Meanwhile, alumna Amanda Insalaco (May 2014) of Elgin was named the Selenia Rolfe Towle Teague intern at the Ellwood House Museum and spent her time researching museum best practices and drafting organizational policies. “It’s been a wonderful opportunity to be more involved in the community and reassuring to have been able to draw directly from things I learned in the classroom,” Insalaco said. Amanda Insalaco at the Ellwood House. Insalaco and fellow CLCE alum, Jacob Buckrop (May 2014) of Rock Island, are teaching English in South Korea during the 2014-15 academic year. Current CLCE major Sarah Trygstad of Sterling continued her work as a student board member with the Kishwaukee Symphony Orchestra. She began in this role last spring after enrolling in a CLCE special topics course on boards and governance. Participants in the course become student board members with nonprofits, attend meetings and work in subcommittees while learning about effective practices for boards of directors. Trygstad also participated in the NIU Office of Student Engagement and Experiential Learning’s Summer Research Opportunity Program (SROP), where she spent the summer researching philanthropy to public libraries with research mentor Ben Bingle and professor Alicia Schatteman. Other CLCE students had similarly impressive experiences this summer. CLCE minor Jaclyn Cox of Sycamore interned with the Sycamore Chamber of Commerce, where she focused on marketing, promotion and event planning. CLCE majors Brooke Russell of South Elgin, Carson Cross of Piper City and Sabrina Hull of Bloomington worked with organizations that provide summer camp programming – Girls in the Game and Camp Shaw-Waw-Nas-See, respectively. 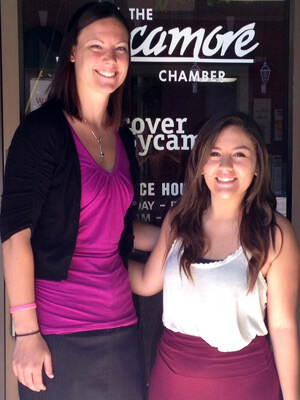 Jaclyn Cox (right) with her internship supervisor Katelyn Fogle outside the Sycamore Chamber of Commerce. CLCE students will benefit from practical experiences in a variety of courses this fall as well. Organizations offering service-learning or internship opportunities include Family Service Agency, Safe Passage, DeKalb Area Agricultural Heritage Association, Econ Illinois, Ellwood House Museum and the Kishwaukee College Foundation. Established in 2010, NGOLD’s purpose is to enhance civil society through academics, research and programming related to non-governmental organizations, nonprofits and other avenues of public service. NGOLD offers the interdisciplinary CLCE undergraduate major, minor and certificate and provides comprehensive programs and services to students, faculty, researchers and organizations. For more information, call (815) 753-4410 or email ngoldcenter@niu.edu.